Turkish President condemns Israel for responding to Arab riots on Temple Mount, threatens Security Council action. Turkish President Recep Tayyip Erdogan on Thursday launched yet another verbal attack on Israel, this time over its actions on the Temple Mount. According to the Today’s Zaman newspaper, Erdogan slammed Israel over its “raid” on the Al-Aqsa Mosque, and vowed to take the issue to the UN Security Council. Addressing reporters ahead of a visit to Turkmenistan, Erdogan called Israel's actions barbaric and said Turkey will not remain silent. He further claimed that ulterior motives were behind the Israeli raid, saying that whenever the international community pays attention to other parts of the world -- referring to recent conflicts in the Syrian cities of Kobani and Aleppo -- a crisis like the one at the Al-Aqsa mosque breaks out. 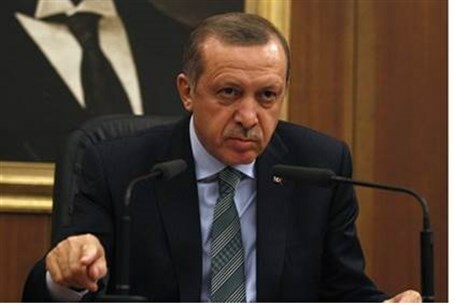 “I hope the Israeli government deals with this issue immediately and the Al-Aqsa mosque is opened to all Muslims soon, or Israel will be left alone in the world like it is now in the [Middle East],” Erdogan threatened, according to Today’s Zaman. He was referring to the violent Arab rioting on the Temple Mount on Wednesday, which forced police to enter the mosque as rioters barricaded themselves inside. Wednesday’s incident was just the latest Arab provocation in Jerusalem in general and on the Temple Mount in particular. Nevertheless, it is Israel which has continuously been blamed for taking action against the riots. The Turkish Foreign Ministry said in a statement on Wednesday that it condemns the Israeli police's “indifference” to the Al-Aqsa mosque's "spiritual values and sensitivities." It added that the act added a new and much more serious dimension to Israeli provocations against Palestinian Arabs, according to Today’s Zaman. After Wednesday’s violent Arab rioting, the Jordanian government announced it would be withdrawing its ambassador to Israel. Egypt has also gotten involved, with senior Egyptian officials having contacted their Israeli counterparts in the last two days, threatening that the tensions over the Temple Mount may cause "regional deterioration." Erdogan’s comments are the latest in a long series of verbal attacks on Israel, dating back to the 2010 flotilla, after which Erdogan cut ties with Israel. This past summer, Erdogan once again went into tirades against Israel, this time over Operation Protective Edge in Gaza. He threatened to end the normalization process with Israel over "state terrorism."